REGENESIS offers two advanced zero-valent iron (ZVI) products, AquaZVI™ and MicroZVI™ which are proven to promote In Situ Chemical Reduction (ISCR) of contaminants within the subsurface environment. Both ZVI products are delivered as colloidal suspensions at 40% ZVI by weight with particle size in the range of less than 5 micron. 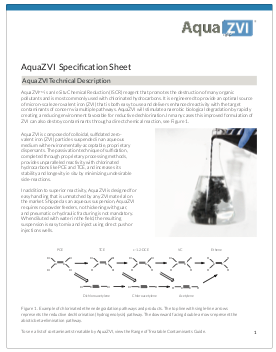 AquaZVI is an aqueous suspension manufactured employing a state-of-the-science sulfidation process resulting in a particle coating which increases activation toward specific contaminants and extends performance longevity. MicroZVI contains ZVI suspended in food grade glycerol. While both products destroy contaminants abiotically, they can also be employed to stimulate ISCR-enhanced bioremediation. REGENESIS provides MIcroZVI and AquaZVI to our engineering firm/contractor clients with a paid-up right to use the products as intended under US Patent 7,531,709. ZVI products, such as AquaZVI and MicroZVI, are used in soil and groundwater remediation as an in situ chemical reduction (ISCR) reagents. Chemical reduction is the process of adding or donating electrons to contaminants, while chemical oxidation is the process of removing or accepting electrons from contaminants. The ZVI acts as a reducing agent to provide electrons directly to the contaminant for degradation or to support processes that require electrons to degrade contaminants. Want to learn more about zero-valent iron products? Download the Tech Bulletin here. AquaZVI™ is an aqueous suspension of sulfidated, colloidal zero-valent iron (ZVI) that promotes the destruction of many organic pollutants, including chlorinated solvents, pesticides, haloalkanes and energetics. It is engineered to promote multiple pathways for contaminant degradation which leads to faster cleanup while minimizing daughter product formation. In addition, AquaZVI is easy to handle and simple to inject leading to significantly better reagent distribution. AquaZVI is composed of colloidal, sulfidated zero-valent iron (ZVI) particles suspended in an aqueous medium with environmentally-acceptable, proprietary dispersants. The passivation technique of sulfidation, completed through proprietary processing methods, provides unparalleled reactivity with chlorinated hydrocarbons like PCE and TCE, and increases its stability and longevity in situ by minimizing undesirable side-reactions. 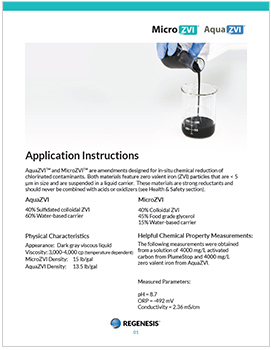 In addition to superior reactivity, AquaZVI is designed for easy handling that is unmatched by any ZVI material on the market. Shipped as an aqueous suspension, AquaZVI requires no powder feeders, no thickening with guar, and pneumatic or hydraulic fracturing is not mandatory. When diluted with water in the field, the resulting suspension is easy to mix and inject using direct push or injections wells. AquaZVI is diluted with water on site and easily applied into the subsurface through low-pressure injections. AquaZVI can also be mixed with products like 3-D Microemulsion or PlumeStop® prior to injection. Want to learn more about the benefits of sulfidated zero-valent iron? 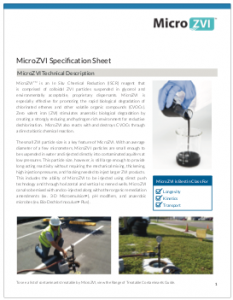 MicroZVI™ is an In Situ Chemical Reduction (ISCR) reagent that is comprised of colloidal ZVI particles suspended in glycerol and environmentally acceptable, proprietary dispersants. MicroZVI is especially effective for promoting the rapid biological degradation of chlorinated ethenes and other volatile organic compounds (CVOCs). Zero-valent iron (ZVI) stimulates anaerobic biological degradation by creating a strongly reducing and hydrogen rich environment for reductive dechlorination. MicroZVI also reacts with and destroys CVOCs through a direct abiotic chemical reaction. The small ZVI particle size is a key feature of MicroZVI. With an average diameter of a few micrometers, MicroZVI particles are small enough to be suspended in water and injected directly into contaminated aquifers at low pressures. 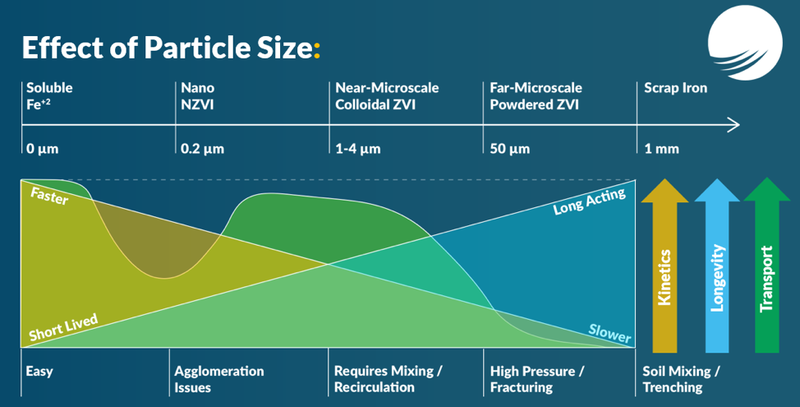 This particle size, however, is still large enough to provide long-acting reactivity without requiring the mechanical mixing, thickening, high injection pressures, and fracking needed to inject larger ZVI products. This includes the ability of MicroZVI to be injected using direct push technology and through horizontal and vertical screened wells. MicroZVI can also be mixed with and co-injected along with other organic remediation amendments (ex. 3-D Microemulsion®), pH modifiers, and anaerobic microbes (ex. Bio-Dechlor Inoculum® Plus). MicroZVI is diluted with water on-site and easily applied into the sub-surface using low pressure injections. MicroZVI is compatible with and can be co-applied with products like 3-D Microemulsion (3DME) and Bio-Dechlor Inoculum Plus® (BDI+).